On Thursday, May 14th we walked from Villarente through Leon and on to Mazarife, a 35km day. Dayton´s left ankle is now double the size of his right and I still have mine taped up for support. We are thankful that the Spanish farmacias are quite aggressive with their drug dosages; Tylenol is sold in 500mg. caplets. Today, Friday, May 15th we walked another 31kms from Mazarife to Astorga. Both the last two days have been really, really cold windy starts. Freezing! The walk today was mostly on those horrible stony paths that are so hard on the feet and ankles. So far my Camino has been more physical than anything else. I haven´t transcended to any level of spirituality, at least not yet. However, I have had a couple of ecstatic experiences, albeit both have been culinary. 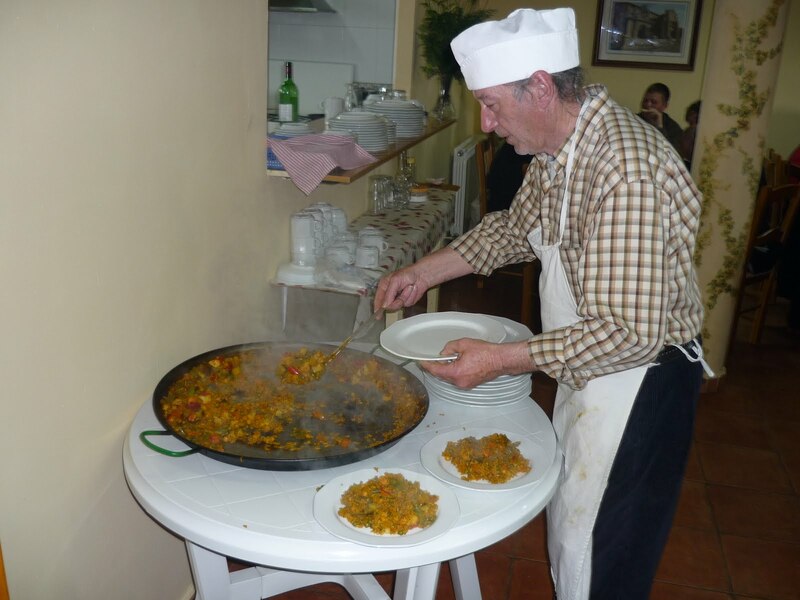 I´ve already noted the wonderful meal Maria Luisa prepared for us in Bercianos del Camino being definitely worthy of a prayer of thanks and rivalled only by last night´s pilgrim´s meal in the Alberque San Antonis de Padua in Villar de Mazarife. Imagine my delight to discover that the meal was all vegetarian and the vegetarian paella rated a standing ovation. The chef had three large paella pans, each about 30" in diameter, mounted on stands fired by propane tanks. After everyone had had their fresh salad, rustic bread ( a far cry from the baquette of WonderBread we´ve been offered lately), and wine and had been served their first dish of paella, the chef set out an extra pan on paella for second and third helpings. That rated a spontaneous round of applause and, just like Maria Luisa and Andre from Bercianos, the chef and hospitalera were so proud and full of joy to have their talents so recognized and appreciated. It was too bad we were too cheap to reserve the 4€ breakfast, as the chef was deep frying churros at 6am this morning as we were getting ready to leave. AAAaaargh. I think there should be a cook-off between the Bercianos team and the Mazarife team and I want to be the tasting judge. Dayton and John had also enjoyed a really great and distinctive breakfast in Leon. They had what seemed like the traditional Tortilla Patatas but these ones were layered, a traditional tortilla on the bottom topped with mayonnaise, tomatoes and onions and then another spinach tortilla on top. If only I ate eggs. We are staying at the Alberque San Javier tonight which is right across from the ancient catedra and an huge monstrosity of a church that looks like Fantasyland or Fairyland from Disney. Tomorrow we´re off to Rabanal and probably will meet up with John, Son and James again.